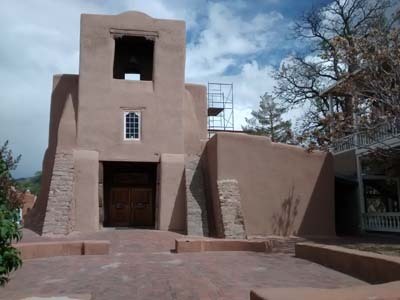 Our plans for Santa Fe included an afternoon at the Georgia O'Keeffe museum. That didn't quite work out. But I think we ended up with an even better peak into her world. 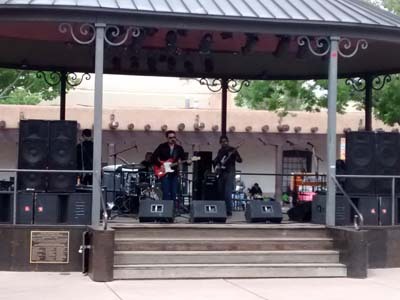 On Saturday, we drove to the Historic Old Town Plaza. We had decided the museum would be the afternoon's activity - the grand finale. 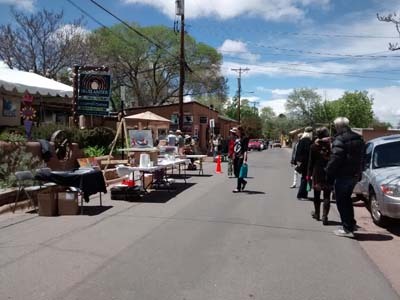 But first: a quick walk along Canyon Road - a unique street we had heard about but missed on our previous Santa Fe visit. There are more than 100 art galleries lining both sides of Canyon Road. We hadn't counted on being enticed to go into almost every one of them. We watched artists at work, enjoyed live music and, at one gallery, sampled complimentary hors'doevres. The weather, cold and damp, meant each stop was a refuge. I think the buildings themselves are art. I wouldn't say we're art-knowledgeable but we have learned a lot over our years of travel and have come to appreciate many forms. Our preferences have gradually gone from strictly realism to some abstract. 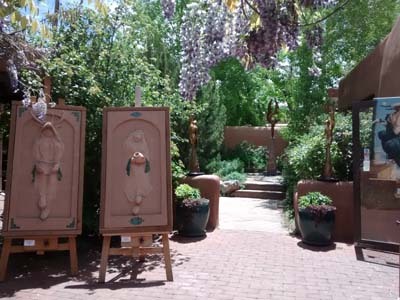 Santa Fe is world-renowned for its galleries. New Mexico artists don't shy away from vibrant colors; I love that! We were so intrigued that we spent a LOT more time on Canyon Road than expected. In fact, we were a bit "galleried out" by the afternoon and felt we couldn't do the Georgia O'Keeffe Museum justice. We continued with an Old Town walking tour instead. 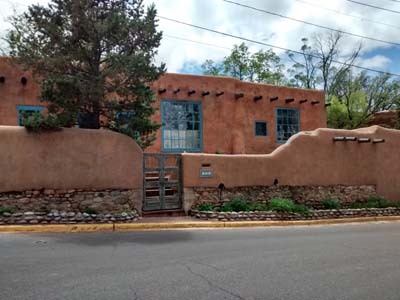 Every building in Santa Fe, whether new or old, is built in the adobe style. I think it’s regulated by the city. 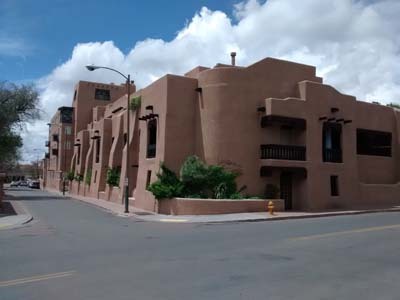 In the historic district, it’s authentic adobe architecture. 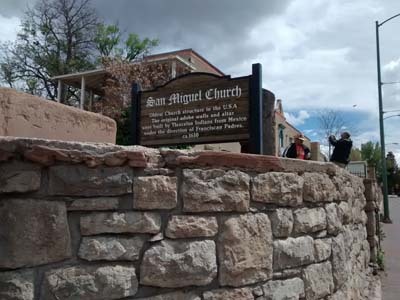 San Miguel - the oldest church building still in use today in the USA! In case you don't believe me (Randy didn't), read the sign. 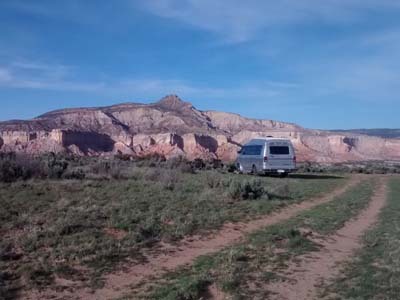 The next day we drove west to Abiquiu. 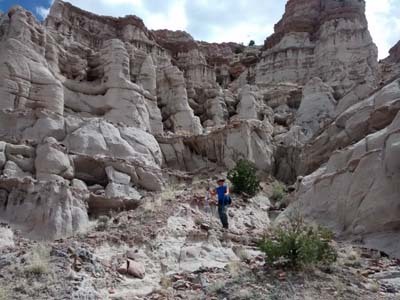 Randy had seen photos of an interesting hiking area near this small village northwest of Santa Fe that he wanted to find. 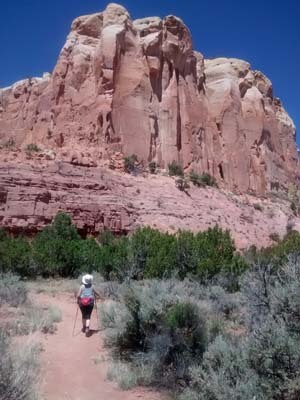 I was excited because Abiquiu was also where Georgia O'Keeffe lived and had two homes, one of them her beloved Ghost Ranch. Maybe we'd still get a small taste of her world. What I hadn’t expected but should have was the amazing setting! 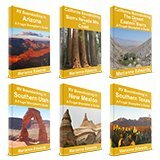 As we drove west, we arrived in a sculpted, colorful, sandstone landscape that rivals any we've seen in the entire Southwest! Those of you who follow me, know that’s saying a LOT! 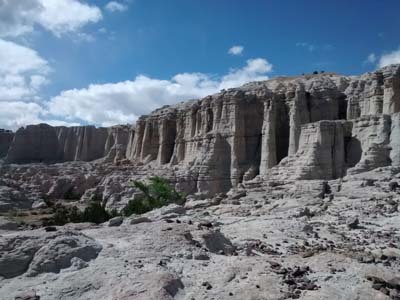 The trailhead at Plaza Blanca is unmarked but we found it at the coordinates Randy had noted from Google Earth. It's on private property owned by the Dar-al Islam community but signage indicates that public entry for hiking is permitted. 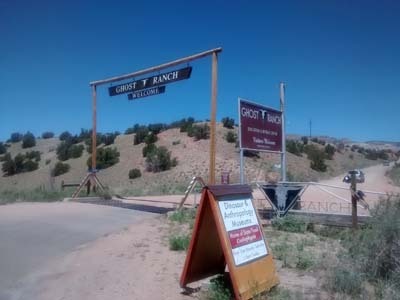 All my research had indicated that Ghost Ranch is now privately owned, a Presbyterian education and retreat center. Their web site indicates public access is limited to tours with advance reservations ($39.00 per person). We don't have one and that cost seems a bit steep. 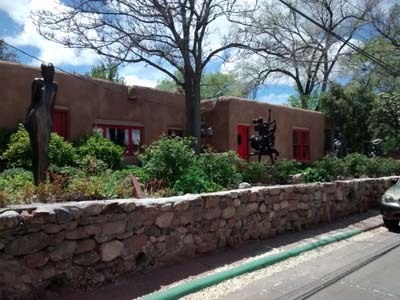 (The museum in Santa Fe was only $12.00). Oh well... But then, at the gate, we see a Visitors Welcome sign. We drove in and discovered to my delight that for $3.00 per person we could wander the grounds and follow a walking guide to see the (outside of) the garden house cottage where Georgia O'Keeffe did a lot of her work. 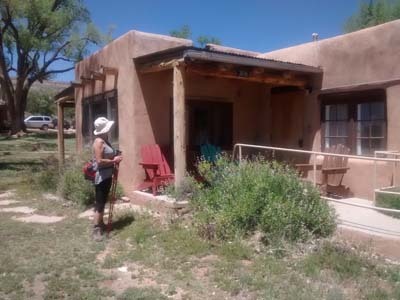 We could even enter the original ranch house as well as several other buildings. 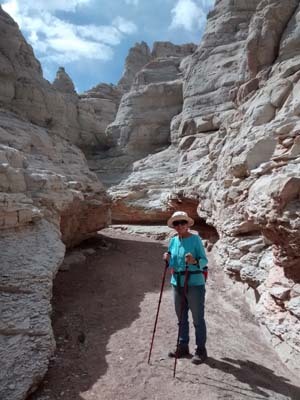 But best of all, we could choose between five different hiking trails, each between 2 to 4 miles long, into the spectacular scenery that inspired her art. 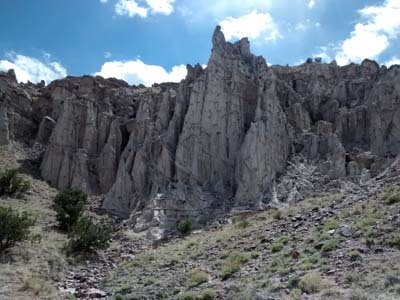 We chose the 4-mile Box Canyon Trail. It was great but I think next time I'd choose a trail to higher elevations to highlight the views. 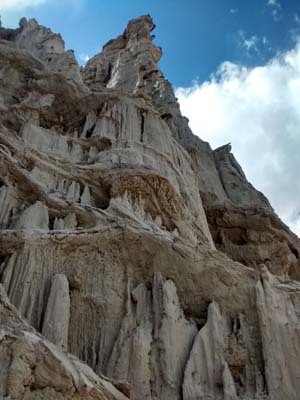 Imagine my delight when I found out that the canyon we had hiked the day before was also a favorite place of Georgia O'Keeffe's and one she often painted. Georgia called it, "the white place". That's exactly how Randy had marked it on our map, since we didn't know it name, Plaza Blanca, until we saw the trailhead marker. 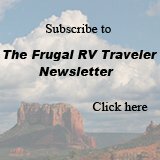 Boondocking near the ranch - what a view! 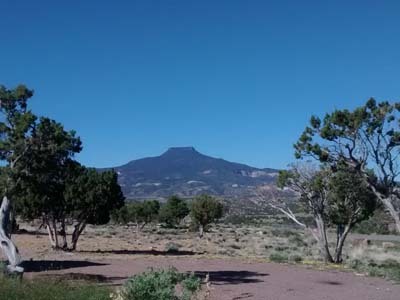 We camped another night at Riana Campground on Abiquiu Lake where an unexpected bonus was this view of Pedernales Peak. Georgia O'Keeffe fans will recognize it from her paintings. She loved it so much that her ashes are scattered at the top. To take in more of this scenery, we drove a gravel road into Chama Canyon. A monastery at the end of the road invited visitors so we spent some time wandering the grounds and even attended the afternoon sext in the chapel. 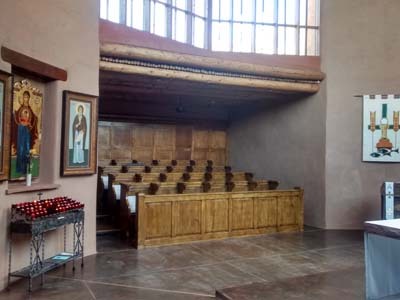 Seeing and hearing the singing/chanting exchange between the thirty resident monks (fifteen on each side of the chapel) was another unique and unexpected experience. 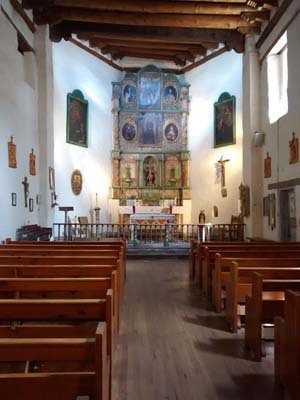 I would have loved a photo of the monks in their traditional garb in the chapel but thought it would surely be considered irreverent. But perhaps they're more approachable than we think. 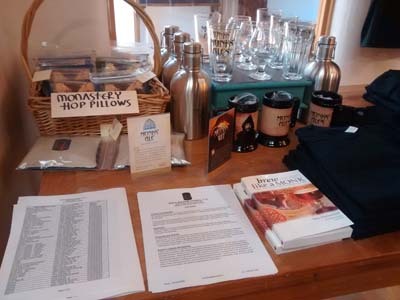 They do continue one of the oldest Benedictine traditions; they brew alcohol. They grow their hops here in the canyon, and make a beer that's widely available in local supermarkets. We should have invited them to happy hour! 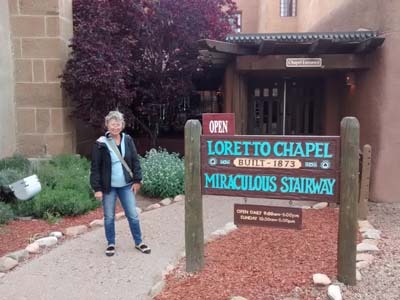 Santa Fe art community, a monastery, Islamic community, hiking, amazing scenery, and plenty of Georgia O'Keefe, after all. No one can argue this has not been a week of variety, and fun, interesting experiences! Enter a title for your comment. Enter your comment (no HTML please). Click here to submit your comment.